There’s no better way to show off your personal style than when you’re out for a relaxing day at the beach, and our Beach Robes are perfect for touting your ideal look. Our Robes are simple, sleek, and elegant ways to both fit in and stand out while enjoying a calming day out. Our dedication to our craft is seen in our Beach Robes, as each and every Robe is handmade in the USA by our skilled artisans. Each of our Beach Robes are light and breathable and are perfect for any number of casual outdoor activities. Our indigo Denim Panel Robe is perfect for indoors or outdoors. This piece has been hand-dyed indigo and has gone through multiple washing and tumbling cycles for its unique aged quality. 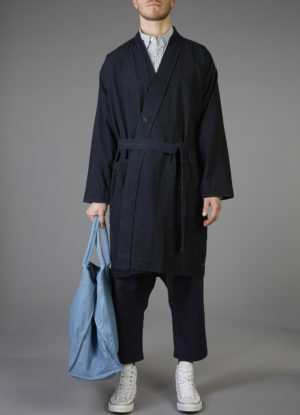 Made out of high-quality, 100% cotton denim, our Denim Panel Robe can be used as an indoor house robe or casual layering piece. We offer cuts for both men and women. The Micro Grid Panel Robe has the same relaxed fit as our denim robe with a subtle micro grid weave and a dressier interpretation in charcoal grey. This unisex robe can be worn inside as a house robe or outside as a comfortable but stylish layering piece. When worn outside, we prefer to wear this open and relaxed. The Micro Grid Robe has 3/4 length sleeve, noragi collar, and removable belt. Our Beach Robes are the perfect way to complement your style in leisurely settings. Whether you’re lounging seaside or spending a weekend in, our Beach Robes are the perfect partner. Every single Robe is handcrafted in New York City then hand-dyed by our artisans. By combining precise attention to craft and detail with intricate tactile textures, GREI creations bring vitality to a neutral palette, and our Beach Robes are no exception.